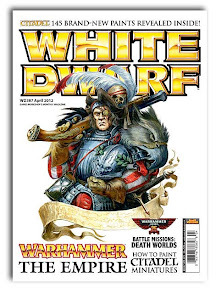 With the April issue of White Dwarf containing a few new rules for games on Death Worlds (24 alternative rules and 3 new scenarios), I thought I might expand on that and provide a few more rules you all can use in your games to add some variety to the normal game of 40k. Adding things like this to your games can really change things up. I've found that they may not be the most balanced and might not be something you want to use if you're looking for a "fair" match, but they add tons of life to any game you include them in. The first thing is a huge set of hazardous environments (66 of them!) This is not mine, it came from GW a long time ago and all I did was translate it into a document my old gaming group could reference and use. Fair warning, these are not "fair" and may tilt the game one way or another. That being said, they are a ton of fun to use. The next set of environments comes from an older issue of White Dwarf. 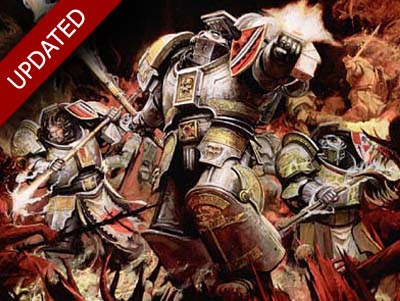 These cover Daemon Worlds and I thought these would have seen a bit more exposure when the Grey Knights came out, but they didn't. While not as in-depth as the Hazardous Environment charts above, they can add some flavor to your game especially if you play Daemons. Even if you don't, they can still make things interesting. And last but not least is one more set of rules to help out. These come from the old Catachans Codex and outline some dense jungle fighting situations. As if true line of sight isn't enough of a problem these days. Some All of these rules are older and are most likely going to need some minor tweaking to bring them in line with today's game. If you're willing to try them though, the tweaking shouldn't be too hard to do. I've used the hazardous environments before and had a blast with them. If you're like me, you'll end up with an environment that simply unravels your army in the first turn before you've even had to deal with your opponent. UPDATE: Here is the White Dwarf Cities of Death supplement that was mentioned in the comments. It has a few more strategems and a handful of new scenarios as well. Enjoy! There is no "auto-tie" mission already! Kai: Enjoy them, they make for some "fun" games... not so much competitive. most people have forgotten that games should be fun! Those rules are definitely focused on adding fun to the game. Remember a game using the Jungle Fighting rule way back in the day using Deathworld Veterans and the, then newly released, Kroot Mercenaties. Most fun I ever had playing a 40K game! Both lists were huge underdogs against any other opponent, but against eachother they were perfectly balanced. A brilliant heads-up. 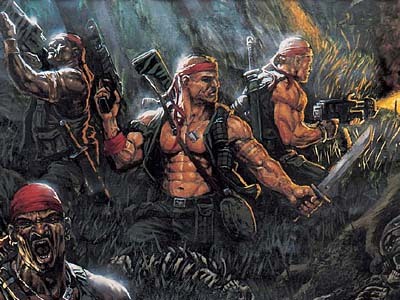 That picture takes me back to my first Guard army, Catachan Jungle fighters. I'll have to dig out my old Deathworld stuff now! Hephesto: See, it's not whether or not you win or lose, but how much fun you had playing. I can only imagine Kroot and jungle fighting rules. Colonel_Scipio: A little trip down memory lane on a Monday morning. Glad you enjoyed it. Thanks for the links, it is always fun to spice up some death and mayhem between friends! Great collection, Ron! There's nothing like adding a little additional flavour to a game! Come to think about it, I also really enjoyed the updated "Cities of Death" rules that were released in WD some time last year. Some of the deployment options alone make for very entertaining games! Speaking of weird and wonderful environments, does anyone know of a good tutorial for doing swamp bases that look good? I have some Gators for PP, and would like to do a swamp base for them, using the PP bases I have stuck them on. Fayte: That's exactly what they're for! KrautScientist: Do you remember the issue number? If I can dig it up, I'll add them here as well. Marshal Wilhelm: I know of some great resin bases that have broken trees and such and can hold the water effects. Really all you need to do is add the grass and such. But it sounds like you've got your guys on bases already. Maybe it's a matter of paint colors and trying to match what a real swamp looks like. KrautScientist: Thanks for the info! Very cool, Ron - I remember several of these but the WD issues they were in are sadly long lost in a move. Looking forward to adding the treacherous conditions into a game or three in the future! Yeah I have already stuck the minis down and would like to use the WM/H bases. How deep do 'water effects' have to be to look reasonable? Mordian7th: I'll be adding the CoD rules from the WD issue mentioned before. I managed to dig it up the other day. Marshal: Not very deep. I've found the trick to be in the painting underneath the "water effects." Paint it to look like water and all the "water effect" does is make it glossy enough to appear as though it's water. You could do the same thing with a nice, thin (and SMOOTH) layer of gloss coat if you really wanted to. Marshal: Thanks for the link. It's kinda cool to see what others do outside of our little world sometimes. 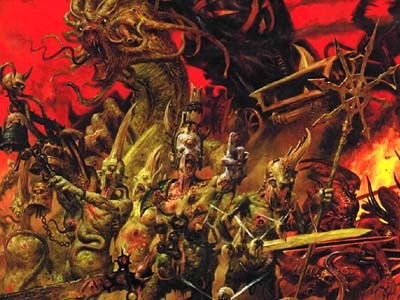 Whilst the LOTR series hasn't really done well for GW, from what I understand, it did bring in a lot of realistic painting techniques into the Studio and onto the pages of Eavy Metal. And I think you can notice an improvement in GW techniques from that time on. But I still think we miss out on some things because of whatever our little world is viewing. I am enjoying getting involved with another manufacturers techniques and products. Marshal: You make a really good point. I wonder how GW would say LotR has affected their work in terms of painting styles and such. I think you're onto something here. And I agree wholeheartedly, getting out of your comfort zone or gaming system every now and then helps. If for nothing other than to see what others are doing.